Rediff.com » Getahead » What can a leader learn from honest outsiders? What can a leader learn from honest outsiders? I've been thinking about the role of the honest outsider in holding the mirror up to organisations. Two elements got me there -- The League of Denial, the PBS documentary on football that came out earlier this fall, and Reza Aslan's book on Jesus, Zealot: The life and times of Jesus of Nazareth. To start, let's talk about Dr Bennet Omalu, who first identified the traumatic brain condition that is commonplace among American football players, CTE. The forensic pathologist conducted the autopsy of Pittsburgh Steelers centre Mike Webster in 2002 after Webster died of a heart attack at 50. Dr Omalu is a Nigerian by birth who knew little about American football as a game -- he didn't watch it even though he lived in a football-crazy city, didn't know anything about the legendary Webster. All he knew was that he was conducting the autopsy of a 50-year old man whose brain showed the wear and tear of a 75-year-old. The game had battered his body, but even more, his brain. In his role as a neuropathologist, he discovered the kind of a trauma he'd never have expected -- a condition called chronic traumatic encephalopathy, or CTE. The condition causes depression, memory loss, and sometimes dementia. Dr Omalu's lack of reverence for the player meant that he was respectful, caring, persistent, thoughtful and ultimately absolutely the right person to work on Webster. He served Webster and his family in ways no fan ever did -- he discovered the truth behind Webster's tragic last years of pain and suffering and showed that it was the disease, not the man, that was flawed. The documentary talks about the shameful way the NFL went after Dr Omalu, destroying his reputation and cutting him off at each turn. The truth will out, though... and in this case, Dr Omalu's persistence and integrity mean that the young children going into the sport today will be protected to some extent from the myopia of the NFL, which is finally trying to change the rules of the game to make head trauma less of a possibility. My own concern is that the game will never be safe, and watch closely the games my children have chosen, like soccer, which have their own inherent risks. I'm also currently reading Reza Aslan's Zealot: The life and times of Jesus of Nazareth. While there is a huge amount of controversy around the book, as is wont to be in any analysis around religion, I was struck by the level of emotion in the attacks on Aslan. I studied at a school in Chennai that was attached to a convent, and remember wandering in to the chapel early some mornings and communing with God. The space was quite and prayerful -- and I respected the attitude of love, charity and giving that the nuns exuded. Aslan talks about his own early experiments with religion, including his time as a Christian, when he converted as a child. He rediscovers Islam later, but clearly continues to be moved and inspired by the core constructs of Christianity. Most useful is his thoughtful review of the evolution of Judaism, the role of Rome, the individual voices that dynamically told the stories that crystallised into traditions that many live by today. While I'm not a Christian, I could see how I'd find it hugely freeing to know a little more about the great men and women who molded the great traditions of my faith, and the circumstances that fed the dogmas that emerged. Recognising them and then engaging with them would be a constructive thing to do, one suspects. What can a leader learn from such outsiders? Are there blind spots that bear closer examination? Are there opportunities for growth that will protect you and your people, or grow you in ways that make you better able to succeed as the world evolves around you? In most cases, they know they are taking on powerful interests. Most outsiders know that telling the truth to power is tough, but they do it because they see the merit of integrity. The best leaders listen and think before they respond. Engage constructively -- less "but" or "I know"... more "how can we test that this is really the case". Have a method for testing, even if it's as simple as focus grouping the question with your team or a small group of your own faithfuls/employees. Respond constructively -- evolve and grow. What about the outsider -- what can they do to be effective and constructive? Recognise that you are part of a change process -- know that you will not be popular. Be truthful -- you may not be a data wonk, but establish and communicate your approach. My own experience has been that there is only so much data you can collect, and people who do not want to be convinced won't be, so capture enough information and data, and then make sure you communicate it thoughtfully. Examine your own motivations -- if there is any self-interest involved, either remove that motivation or be absolutely transparent about it. That way, it is clear to everyone where you are coming from. 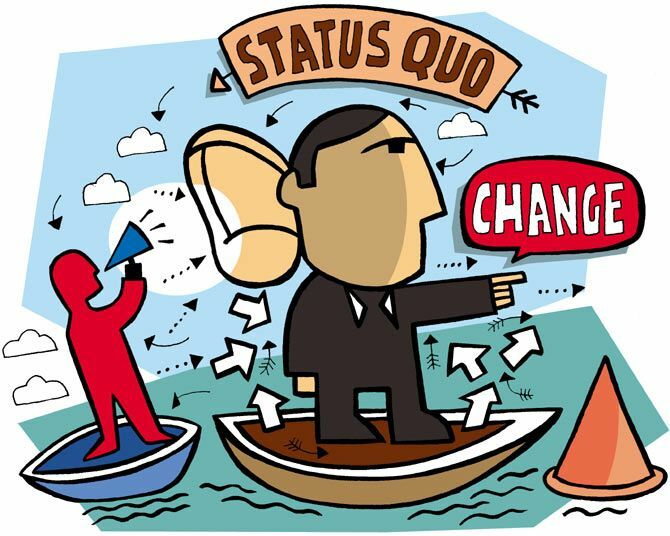 Above all else, understand the others point of view, which is often the status quo. Chances are, you won't agree with it anyway, but it is good to understand where the rest of them are coming from. Work with an empathetic insider, if you can. In most organisations, there are respected influencers who have the long-term well-being of the company at heart. If you can find and work with them, you'll be helping the change process along significantly. In Dr Omalu's case, his cause was moved forward significantly by the doctor the NFL granted access to, Dr Ann McKee, a self-confessed Steelers fan.